Find hotel near Gradski Stadion Banja Luk ..
Bosnia and Herzegovina has a few grand tourist attractions and if you are in the country, do visit the Gradski Stadion in Banja Luka. Opened in 1937, the Gradski Stadion is a stadium which serves as a historical place of interest in Banja Luka. For decades, the stadium has fuelled the passion of the locals for football and currently it is the home of the Borac Banja Luka football club, a local favourite. You can explore the stadium during open hours, put in a few hours of practice workout if you are a keen footballer, or even catch a match along with the native crowd. How popular is Gradski Stadion Banja Luka? 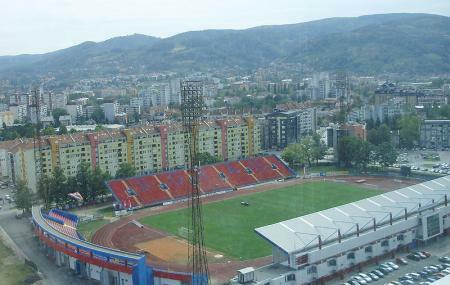 People normally club together Narodno Pozorište Republike Srpske and Aquana while planning their visit to Gradski Stadion Banja Luka. Vultures makes fantastic atmosphere. Borac is i the i best club.